Designed to take advantage of Taiwan’s cooler winter months (which are still pretty warm given our subtropical latitude), this tour starts in southeast Taiwan and passes through the beautiful Rift Valley for four days of astounding cycling, hot springs and botany appreciation. Prepare to be astounded (and in a few cases, mildly challenged) by the cycling, awed by the scenery, and thoroughly pampered by a combination of excellent custom curated meals and visits to one of southern Taiwan’s finest hot springs. While other cycling tours may focus on packing in the miles, this tour is focused on providing an unforgettable experience in which amazing cycling is but one feature among many. This tour requires both a reasonable degree of physical fitness. Your guide reserves the right to alter cycling route details based on any unforeseen circumstances conditions. Southern Taiwan’s Luye County is best known for its annual hot air balloon festival, and today we’ll be cycling through a stretch of countryside to which tens of thousands of visitors come each year (and spend big bucks) to gaze down upon. We’ll ride through orchards and rice paddies, stopping for lunch at one of the area’s farm-to-table restaurants, before ending the day at the luxurious Airuomi Villa, a modern boutique hotel surrounded by some of Taitung County’s most beautiful real estate. Get ready for a truly unique riding experience as we ride between two distinctly different geological plates. To the west lies the Eurasian plate, and to the east the Philippine plate, and we’ll spend the day switching between route 193 and the lovely Yufu Bike Path. Our days destination (which we’ll reach after a moderate climb) is the town of Ruisui, where we’ll soak in hot springs and have an amazing dinner that we promise will be a feast for all senses. On day three we’ll continue north, riding 193 through the Rift Valley and into the lush, green Matai’an Wetland Ecological Park before reaching the Fuyuan Old Railway Bicycle Path. The path, part of an extensive network of exclusive cycling roads built around existing (and in some cases, no longer used) railway routes, offers mile after mile of car-free cycling surrounded by mountains on both sides. After a brief and lovely climb, we’ll reach serene Liyu Lake with enough time to ride around the lake once before having dinner by the shore. The fourth and final day of our tour starts with an invigorating downhill from Liyu Lake into the rice-growing region of Hualien county. We’ll spend the first part of the day riding quit roads winding through farmland before reaching Hualien Harbor. After a celebratory seafood feast, we’ll have an optional slow ride along the coastal road north past Qixingtan Beach before looping back to end our ride in Hualien City. This tour requires a minimum of 4 people to operate. There is a possibility of cancellation after confirmation if there are not enough passengers to meet requirements. In the event of this occurring, you will be offered an alternative or full refund. My boyfriend and I travelled to Taipei in March for a wedding and wanted to take advantage of the great local cycling infrastructure to see the east coast of Taiwan by bike. We decided to arrange a customized bike tour with MyTaiwanTour after a positive review from the Los Angeles Times and it was the best experience EVER. I've done cycling trips with REI in France and various bike tours across the country and nothing comes close to the experience we had with this company. From the get-go, our coordinator was responsive (even though we planned this trip toward the onset of the Lunar New Year) and adjusted the trip as needed per our requests. They picked us up from our hotel in Taroko Gorge and scheduled visits to see our desired highlights (monkeys, hot springs and food anyone?). Our tour guide, Josh, was unimaginably overqualified for the tour guide role. Having written for the Lonely Planet Taiwan Guidebook and living in Taiwan for I-don't-know-how-many years, Josh not only interfaced with the local population in fluent Chinese but was also able to elucidate in terms that engaged and connected us Yankees to the history and culture of the area. On top of our own private guide on two wheels, my boyfriend and I also had a private tour driver, Lion, who was the kindest and most accommodating human being ever. One day when my bf took a fall, Lion was right behind us, picked us up and drove us to a local clinic. He was also there for us when we got tired of riding through the rain and drove us the last 10 miles to our next hotel. In my mind, for just two people to have both a tour guide and a driver (and both top-shelf at that) for an affordable price is unbelievable. Absolutely perfect bike tour, cannot rave enough about it. 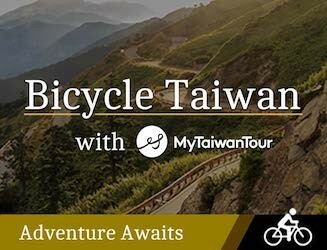 Highly, highly recommend if you are looking for a customizable cycling tour in Taiwan. It will top all your Taiwan highlights by far. Our favorite thing about cycling in Taiwan is the “加油” (Jiā yóu, which means “Keep Going” or “Go!Go!Go”) along the way. Everyday we met great people and great thing to eat. There are many small cycling path, just amazing to cycle. 61 people have browsed this in the last week.